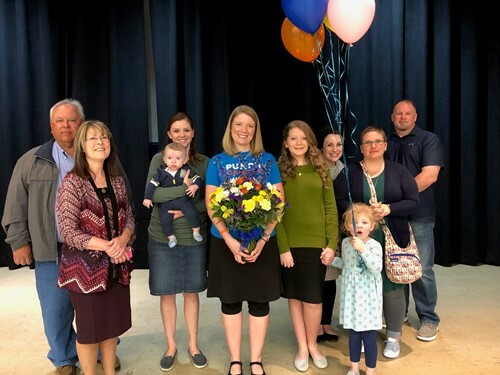 One of the highlights of Legacy Week is the announcement of Teacher of the Year. Every teacher is deserving of the title; but sometimes a teacher distinguishes himself/herself by going beyond the contractual obligations of the job by touching the lives of students in the classroom, outside of the classroom, and beyond the classroom years. This description perfectly fits this year's Teacher of the Year, Mrs. Kandice Tucker. Mrs. Tucker teaches all levels of math. She offers many tutoring sessions and is often available before school and after school for those students who need a little more help. Several years ago, she "flipped" her calculus classes by recording her lessons. Students, even after they leave Broome, continue to refer to those videos during their college calculus years. Mrs. Tucker is also known for her love and compassion for all students, not just those students at Broome. She is a school-leader in raising funds for District 3's Christmas Assistance Fund. Her PBL group joined forces with Ms. Kingland's group to crochet hats and bears for children who are receiving treatment for leukemia. During her time away from school, Mrs. Tucker is the manager for her husband's bluegrass band Backline.